I actually found this model probably about a year or so ago and just loved it so much that I have had it in mind for this series since I started it a month ago. Eldar models always give painters some great opportunities for extravagant techniques. Whats great about this mini is that it is so simple but so beautiful and well done. Its not often that you see a monochromatic model in our hobby and this one has been pulled off excellently. 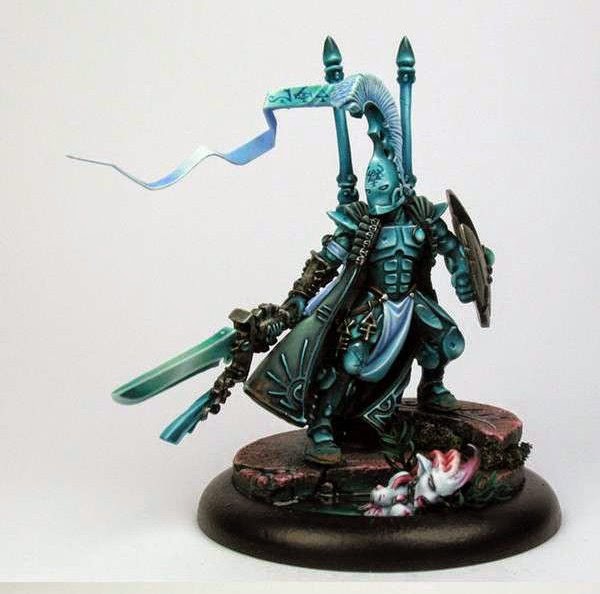 Teal is a color that is really tied to the Eldar visually and the painter has achieved enough variation between the different areas of the model that it doesn't all blend together but still reads as almost one color. The base is also very simple yet powerful. We have the dead Deamonette submerged on the base, which of course is the Eldar's greatest enemy. I also really like how he has used different shades of pink to paint the whole base. 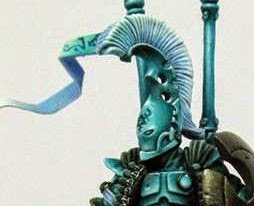 Again it is monochromatic (okay, so I guess this model is actually dichromatic, but the colors are separated by mini and base) and also reinforces the Slaanesh feel and goes well with the Teal. The conversion work on this is so subtle and smooth I'm not even sure what's converted, I'm sure some Eldar players out there can tell me. This guy is truly a painter's model and comes as close to art as a mini can get.